Nicolas Cage, who is now a perpetual walking and talking punchline whose very face can elicit a laugh, has become the Zeus of megastar garbage. Every once in awhile, Cage’s persona is used in the correct film, like Adaptation or 2009’s giddy Bad Lieutenant: Port of Call New Orleans. The roster of ultra-bad movies on Cage’s resume is astonishing for a man who once commanded $20 million or roughly around that figure per picture. It’s not that Cage is in a ton of bad movies; you can argue in the past decade for movies such as The Family Man, Matchstick Men, The Weather Man (anything with “man” in the title, apparently), Lord of War, and World Trade Center, none of which were big hits, and you can include the aforementioned Adaptation and Bad Lieutenant. His hits are suspect or downright bad (Ghost Rider, National Treasure 1 & 2), but where Cage gets his current reputation is movies like The Wicker Man, which in its awesome badness has been mercilessly kicked around by YouTube. Movies like Next, Knowing, and Bangkok Dangerous don’t help matters. For me, Cage went on the downward spiral after 1995’s Leaving Las Vegas earned him an Oscar. He went on to take the money with Michael Bay’s The Rock, an enjoyable summer action flick that unfortunately then led to Con Air and Gone In Sixty Seconds, directed by his Season of the Witch cohort Dominic Sena. We started seeing Cage’s cracked take on the mainstream in The Rock and Face Off, movies that did well enough to excuse the madness. But if you want to see Cage becoming the Cage as we now see him, look no further than Joel Schumacher’s 8MM, which I probably would rank as one of the worst movies of the nineties. When Cage asks a grieving mother if he can kill the man who is responsible for killing her daughter, the way he does that scene sums up the Cage we all like to point and laugh at. 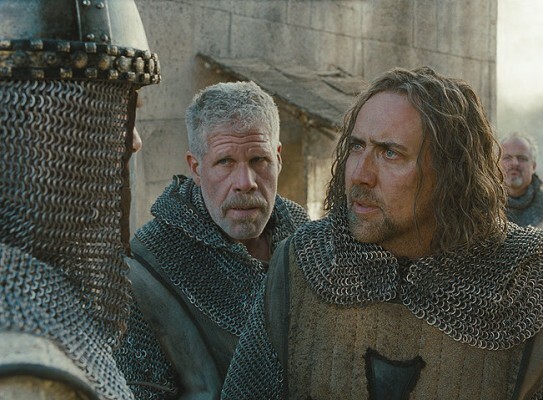 In Season of the Witch, part of his ever-growing library of badness, Cage plays Behman, a knight carrying out God’s work of killing during the Crusades. His friend is Felson (Ron Perlman), and they make wagers about whoever kills the most men gets free beer that night. They are about to enter the era of witch-hunting, as the Black Plague begins to settle in and religious types start blaming it on devilry rather than unsanitary conditions. Their charge is to take a woman (Claire Foy) to a holy place and have a priest read her the riot act of religious healing from a sacred book. So along for the ride is a priest Eckhart (Ulrich Thomsen), his priest-in-training Debelzag (Stephen Campbell Moore), a guide named Hagamar (Boardwalk Empire’s Al Capone, Stephen Graham), and a young man who is quite taken with the girl (Robert Sheehan). The journey, as journeys are, is long and somewhat treacherous, although it is made more treacherous by the girl, who might actually have some sort of witch power after all. So the problem here is that the movie is never at all interesting. Sure, Cage isn’t very good in this, but no one else would be, either. In fact, two actors known for being somewhat “off,” like Cage and Perlman, are wasted here. There are a couple attempts at scares, those fall flat. There’s a couple of boring war scenes in the beginning. There is a scene involving wolves which is really stupid, as it appears that wolves are no different from any other kind of henchmen in a movie, attacking one at a time instead of in packs, which is what we generally believe wolves do. We don’t know what really is at stake here…I guess the whole world is at risk, but I don’t know how the world is supposed to take notice when most of the evil presences in this movie are so easily killed. The movie could have used a little more of a scene very late in the movie where a character is wrapped around demon wings and burned to death. Sprinkle some of those things in here and there and you’ve got a movie, son.